Lupinacci presented New York State Assembly Citations to the newest officers and offered congratulatory remarks to the gathering. 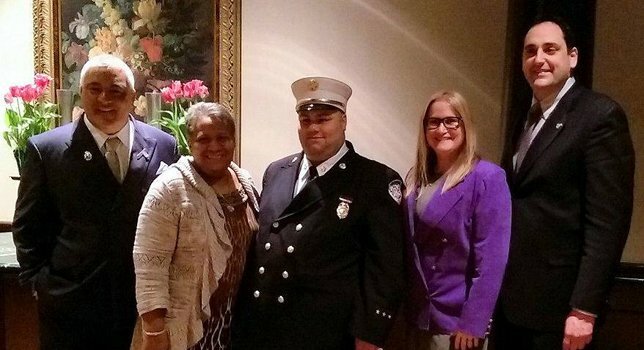 Huntington, NY - April 24, 2017 - Assemblyman Chad A. Lupinacci (R,C,I,Ref.—South Huntington) recently joined the Huntington Fire Department for their 174th Annual Installation Dinner. The yearly event recognizes the newly installed Board of Directors and Fire District leadership roles for the upcoming year. Lupinacci presented New York State Assembly Citations to the newest officers and offered congratulatory remarks to the gathering. Assemblyman Lupinacci represents the 10th District, which consists of parts of Suffolk County. For more information, please visit Assemblyman Lupinacci’s Official Website. Subject: LongIsland.com - Your Name sent you Article details of "Assemblyman Lupinacci Congratulates Newest Officers Of The Huntington Fire District"